Norbert and his lucky crew of six, about to set off on our boat tour. 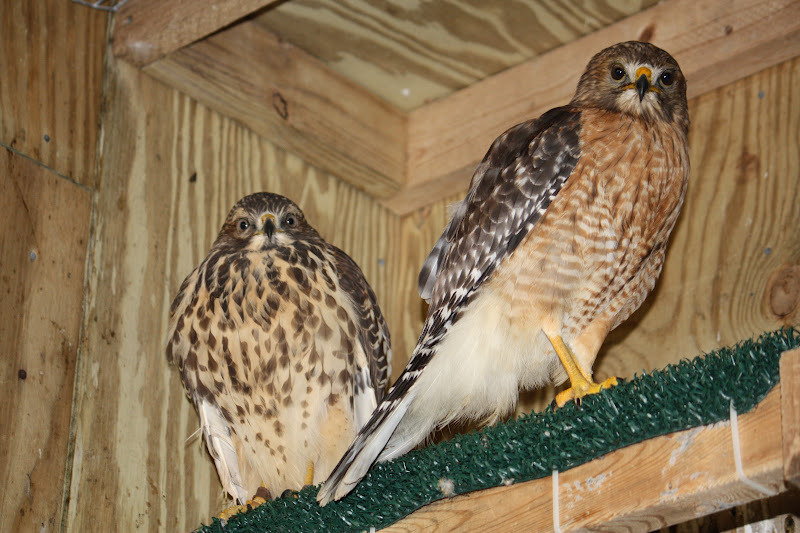 The National Wildlife Rehabilitators Association (NWRA) 2012 Symposium was every bit as gratifying as I had hoped. The first day, Tuesday, was a long one however. I had to leave my house at 4:30 am to catch a 7 am flight to Baton Rouge, LA via Charlotte, NC. My friend and fellow rehabber, Roxy Brandenburg, was on the same flight, and we were both excited to be arriving in time for a tour of Cypress Island Swamp. 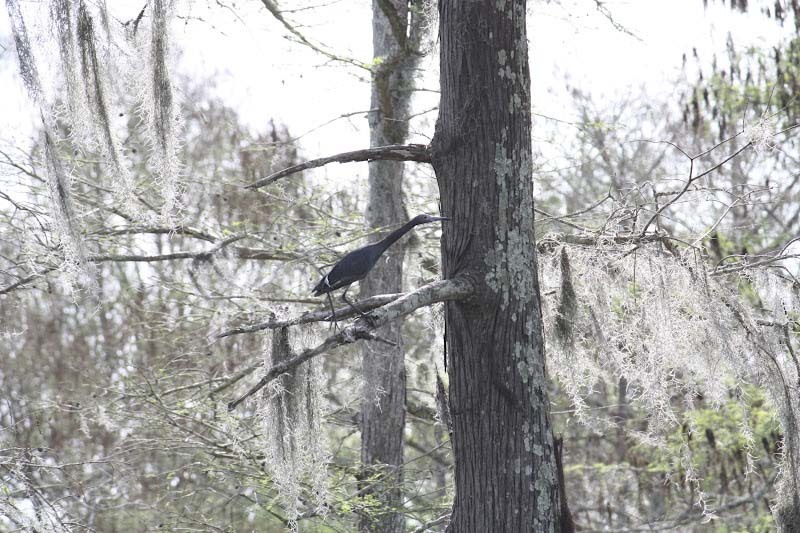 The Nature Conservancy manages Cypress Island Preserve; 9500 acres of cypress and tupelo trees dripping with Spanish moss, and bottomland hardwood forests at Lake Martin. 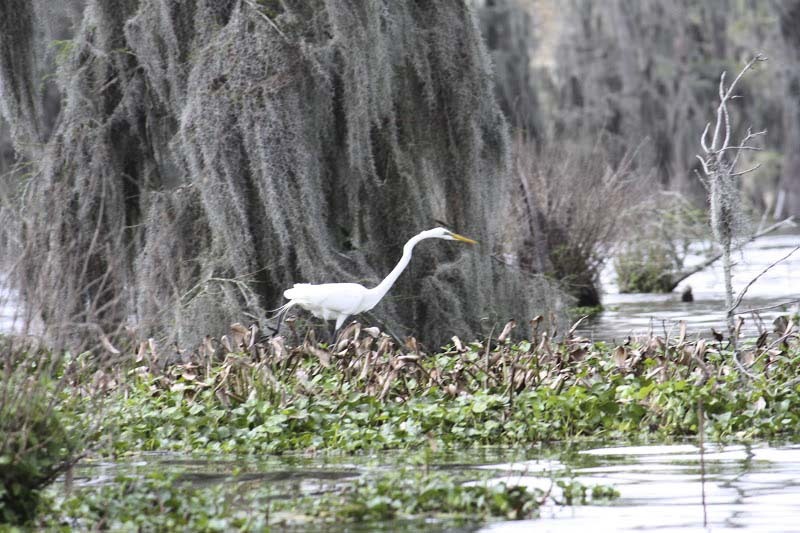 The preserve is part of the Atchafalaya Basin; America’s largest river basin swamp. 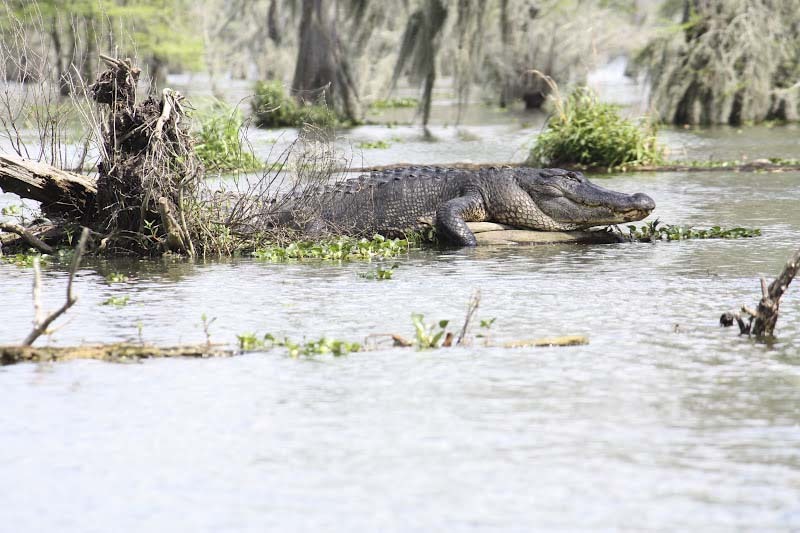 You could mistake this alligator for just another hummock in the swamp. Photograph by Suzanne Shoemaker. 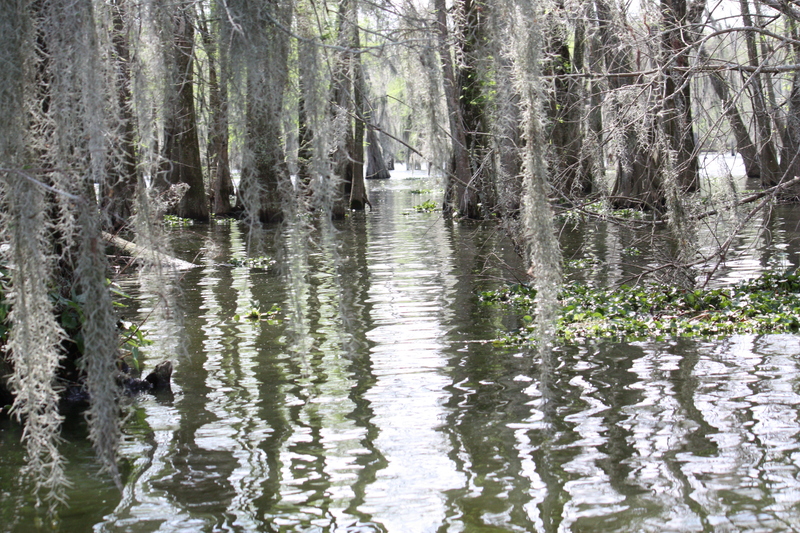 Cypress and Tupelo trees draped in Spanish Moss and their beautiful shimmering reflection in the swamp water. Photograph by Suzanne Shoemaker. Atchafalaya Basin branches off the Mississippi River and extends 135 miles to Atchafalaya Bay, where it eventually empties into the Gulf of Mexico. You may remember hearing about it last spring, when the Mississippi River was flooding its banks and there was talk of opening up the floodgates into Atchafalaya Basin to save many homes and towns from the floodwaters. The growing delta of the Atchafalaya River is the destination of thousands of water birds that migrate along the Mississippi Flyway. More than 300 species overwinter in the diverse habitats it offers, and hundreds more use these habitats to sustain them on their migration to points further south in Mexico and South America. For more information about this incredibly important wetland check out this website: http://www.basinkeeper.org/. Our first stop was The Nature Conservancy’s Cypress Island Visitor’s Center, where we disembarked for a quick bathroom break. Most of us, eager to go back to where we had just passed hundreds of Great Egrets in the trees and on nests, got right back on the bus to proceed, but I later learned that one person was rewarded for her dallying. She walked down to the water’s edge where she disturbed a black snake napping on the shore. When she got out her camera to take a picture, the snake opened its jaws to reveal an enormous “cotton” mouth. She had inadvertently disturbed a Water Moccasin, and had snapped a great photo of its signature mouth! A Great Egret in hunting mode. Photograph by Suzanne Shoemaker. A Great Egret in breeding plumage, getting set to display. Photograph by Suzanne Shoemaker. 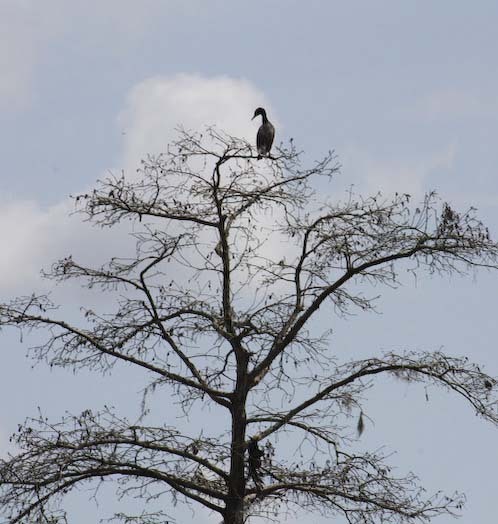 A Little Blue Heron flew into a tree when we passed him in the boat. Photograph by Suzanne Shoemaker. 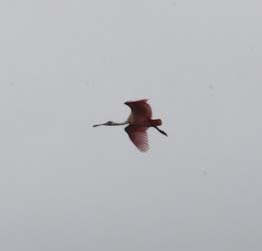 Roseate Spoonbill in flight over the swamp rookery. Photograph by Suzanne Shoemaker. 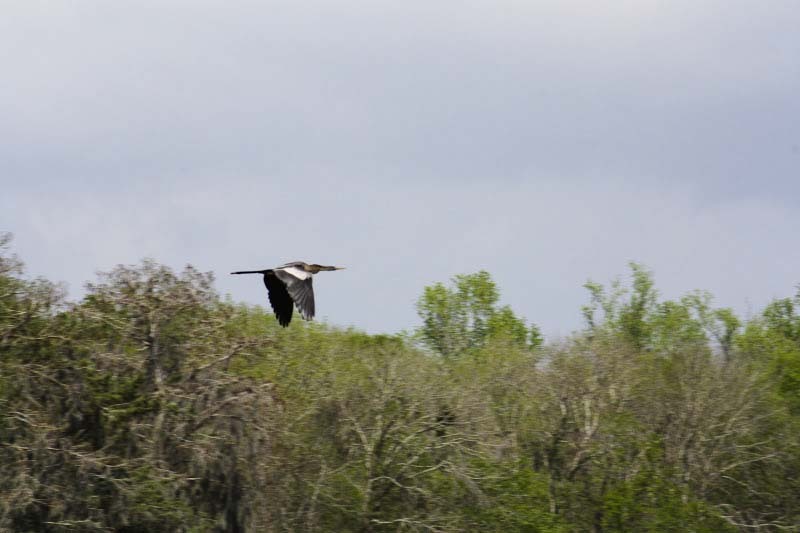 Anhinga in flight. Photograph by Suzanne Shoemaker. A Crested Cormorant. Photograph by Suzanne Shoemaker. From there we drove a short piece down the road to the docks and broke into smaller groups for our boat tour. I managed to place myself in the smallest boat, a group of six, and we followed Norbert, our 76 year-old native “swamper” guide, to board. My pictures tell the rest of the story. 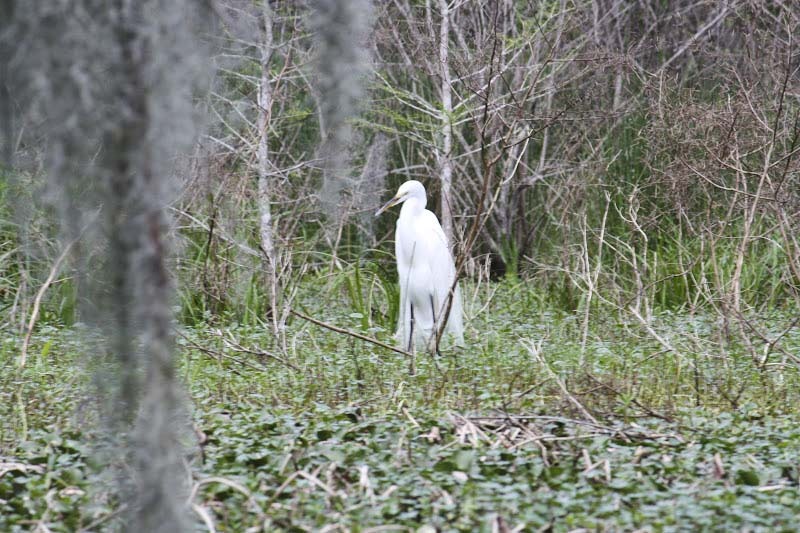 We saw many of the above-named birds in hunting mode, and alligators and turtles galore. The sun had just emerged following a day of record rains (up to 15 inches!) and the reptiles were out basking. 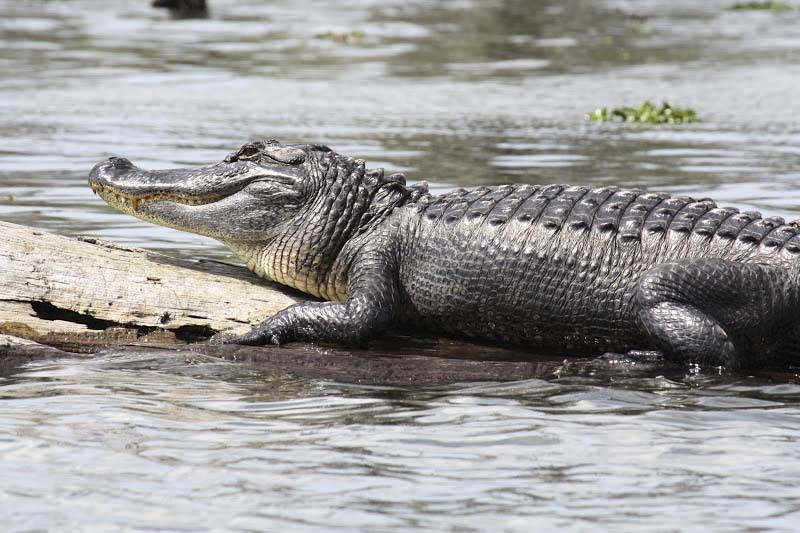 The alligators ranged in size from about 8 feet to 14 feet, and Norbert explained that the age difference was roughly 100 years! An 8-footer being 50 years old, while a 14-footer is 150. A fourteen and a half footer, about 150 years old, probably the oldest alligator we saw. Photograph by Suzanne Shoemaker. 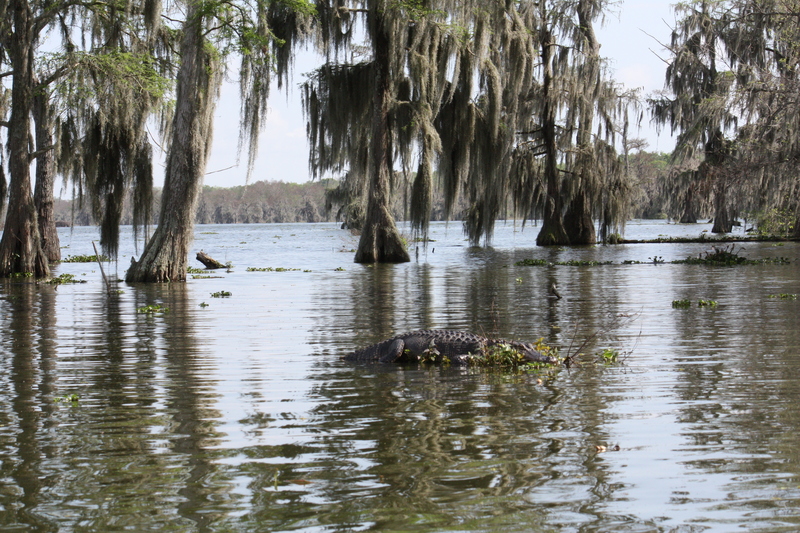 A lazy alligator (about 8 feet long and 50 years old), wondering if we dare disturb his rest. Photograph by Suzanne Shoemaker. One of the oldest of the alligators we saw, showing his age by the "double chin", and the classic "crocodile smile." Photograph by Suzanne Shoemaker. 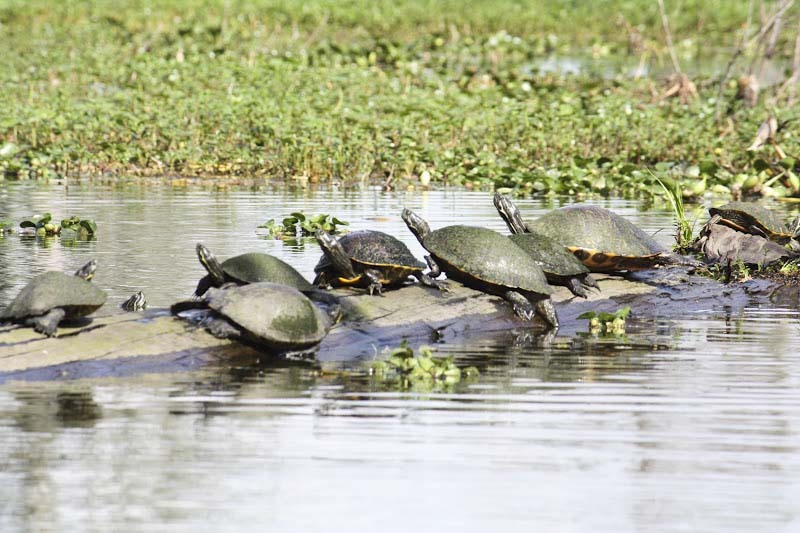 Turtles galore, covered in algae, out basking in the sun after a day of record rainfall. Photograph by Suzanne Shoemaker. 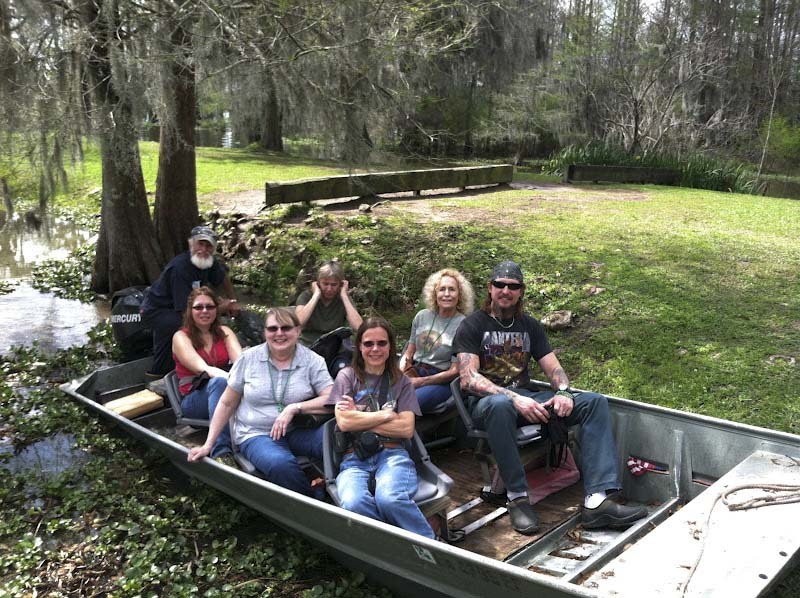 Midway through the tour, Norbert parked the boat in some floating water hyacinth (an extremely invasive non-native plant that requires intense management to keep waterways open), and showed us the minute flowers of Spanish Moss, and how they pollinate by wind. In our nearby surroundings, we saw a 6-foot alligator, a “chameleon” Green Anole Lizard change color, and another Brown Water Snake. 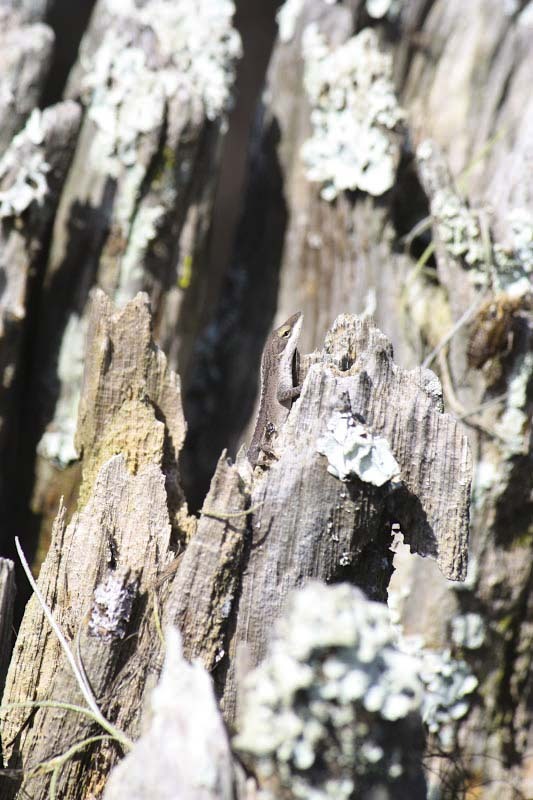 A Green Anole Lizard turned brown in perfect camouflage against the bark of the Cypress. Photograph by Suzanne Shoemaker. Norbert then got out some tattered clippings of a National Geographic article that showed him as a younger man in the swamp. He had grown up in the swamp, and raised his own kids on a diet of wild swamp critters, including alligators, turtles, beaver, and raccoon. Last but not least, Norbert pulled out a jug of his very own Moonshine, and poured each of us a shot! It was surprisingly good! Norbert, our tour guide, showing us that it was an appropriate time (somewhere) for him to share a taste of his very own moonshine! Photograph by Suzanne Shoemaker. Finally, Norbert took us to where a few spectacular trees, less desirable as timber due to their prolific branches, grew to the ripe old age of 1500 years! He explained that Cypress is extremely slow growing due to its wet growing conditions, so while these trees have an enormous girth of 10+ feet, they are deceptively old for their size. We also saw the Cypress “knees”, an emergent part of the roots that allow the trees to breathe air, and Norbert explained how the knees are desirable for creating elaborate carvings, and so most had been cut. Somehow the trees had managed to live on. That concluded our wonderful boat tour, and we returned to the docks to board our bus for the ride back to the hotel. An ancient Cypress tree, roughly 1500 years. Photograph by Suzanne Shoemaker. 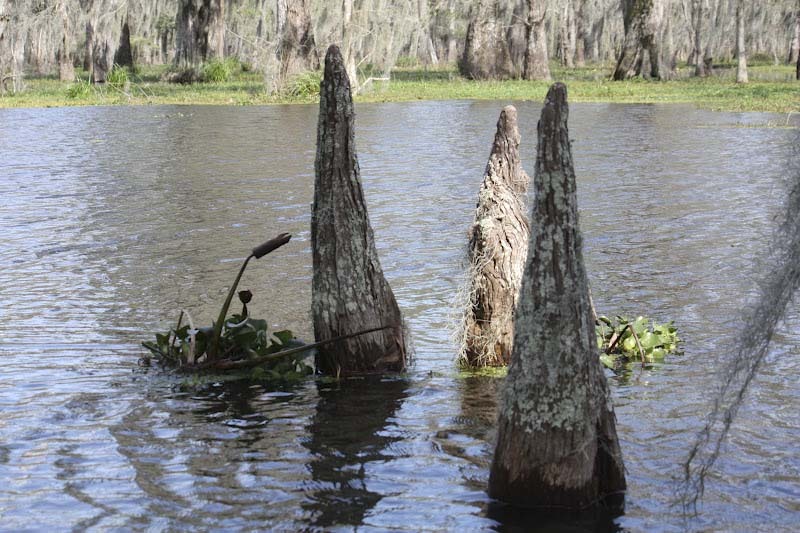 Cypress knees, emergent roots that allow the trees to breathe in an aquatic environment, prized by woodcarvers. Photograph by Suzanne Shoemaker. 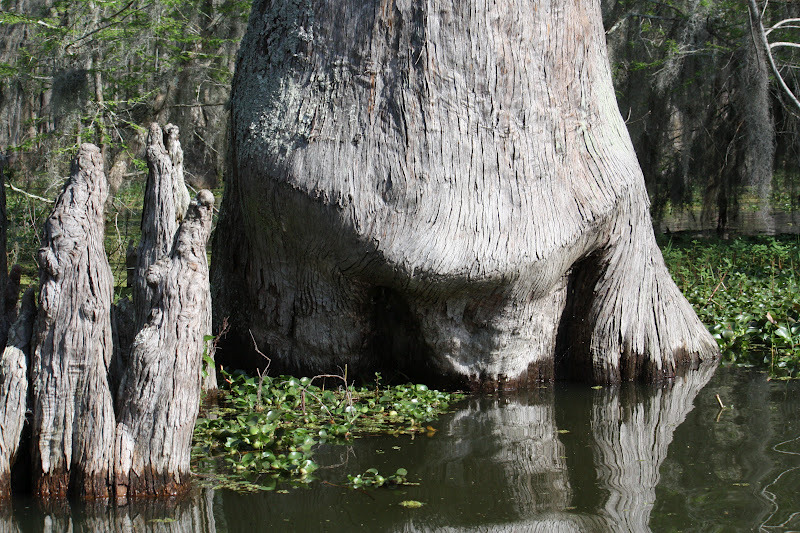 One of our tour guide, Norbert's, favorite old Cypress trees, because "it looks like it is smiling." Photograph by Suzanne Shoemaker. The next day, Wednesday, the NWRA Symposium kicked off with an awesome keynote speech and slide presentation given by C.C. 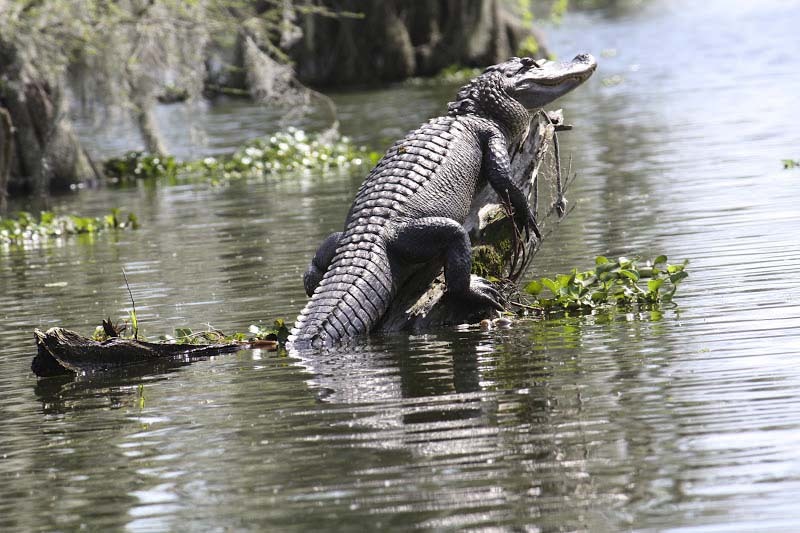 Lockwood, a free-lance photographer who spent the better part of the last thirty years living in the Atchafalaya Basin and photographing its unique flora and fauna. 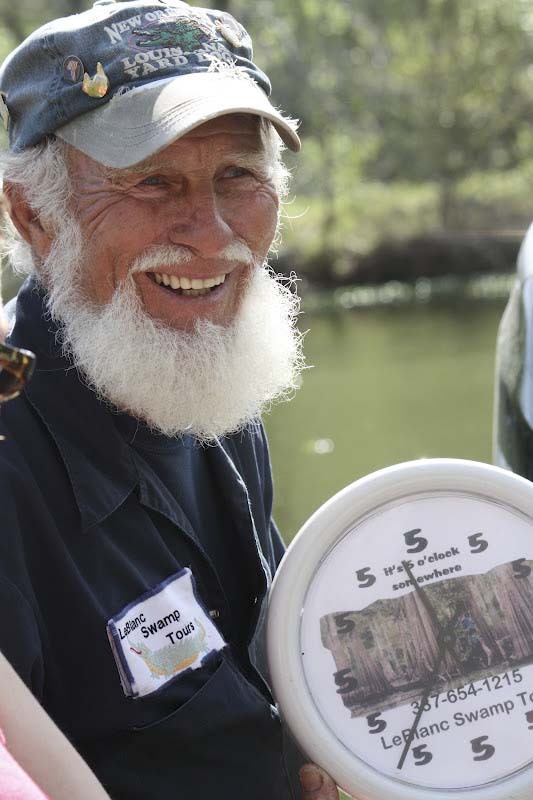 He has written several incredible books and produced an award-winning film on the Basin, published by National Geographic. It turns out that it was C.C. Lockwood who had photographed Norbert as a young man, in the old tattered National Geographic clippings he so proudly shared with us. C.C. 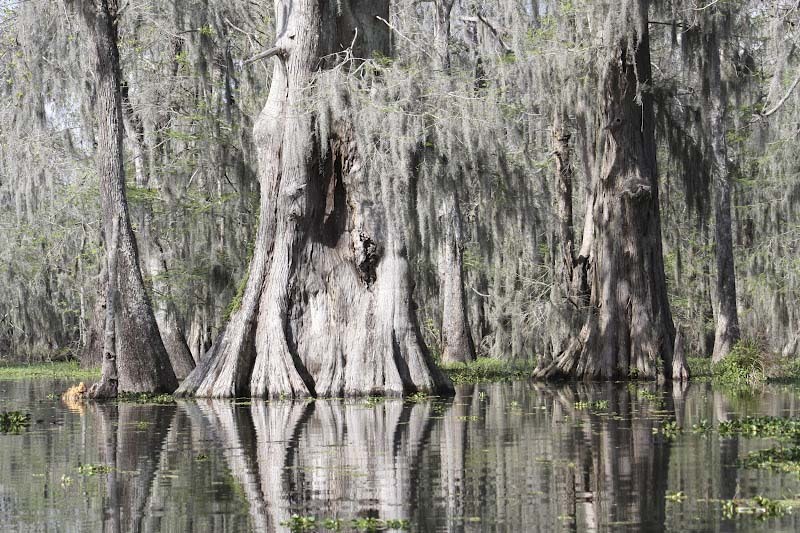 Lockwood’s latest honor is that one of his photographs; of Cypress trees set against a beautiful sky reflected in the water, was selected for the US Postage Stamp celebrating the 200th Anniversary of Louisiana Statehood. It will soon be available at your local post office. These were two highlights of the Symposium for me, but it was only the beginning of a week of superb presentations and informative discussion about a wide range of important topics relating to wildlife rehabilitation ranging from Care of Opossum Neonates and Rehabilitating Sea Turtles to acquiring fish and insects for feeding wildlife, and Getting the Most out of Eagle Scout Projects. 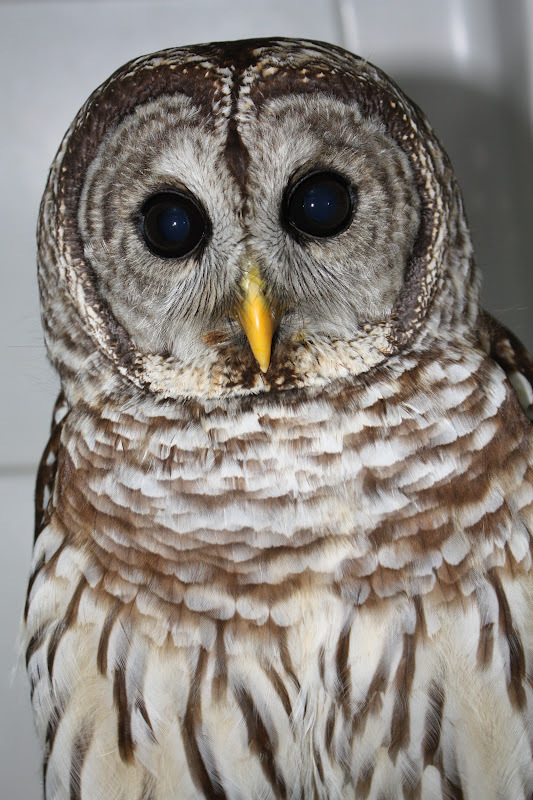 Some of my favorite presentations were Physical Therapy in Aquatic Birds (easily translated for use in raptors), Treatment of Lead Intoxication in Bald Eagles (over 85% of all the Bald Eagle patients received at The University of Minnesota Raptor Center have at least some lead in their blood, and most have clinical signs of lead poisoning), Strigiformes – Why Owls Aren’t Just Raptors by Another Name, Infectious Diseases of Raptors, Reuniting and Fostering Raptors, Triaging Injured Wildlife, and Beyond the Individual – Rehabilitation of Species, a thought-provoking presentation and discussion about the difficult choices required to save a species. I’m sure that, as 2012 unfolds, you will hear more about my experiences and education at the 2012 NWRA Symposium. Meanwhile, I have returned to Maryland and Owl Moon where I am enthused and invigorated to get back to the work of rehabilitating raptors!